Tarot de Marseille, The Tower. The 12th century witnessed a huge building boom. Newly constructed cathedrals and church spires pushed cities ever upwards and closer to God. As with churches so with towers. Some were built as city defences whereas others were privately owned - the most tangible expression of a family's power. Sources suggest there were up to 361 towers along Rome's city walls. In Milan there were estimated to be 120 bell towers and city life was punctuated by bells ringing melodiously throughout the day. In order to enter or leave many cities people had to pass though gates which were often richly adorned with sculptures conveying religious messages. Gates could even prophetic. In Naples people believed that a magic spell had been placed on the city gate. If you entered on the right hand side good fortune would be yours - as indicated by the marble head laughing. On the left there was a weeping marble head - entering on this side might bring you bad luck. 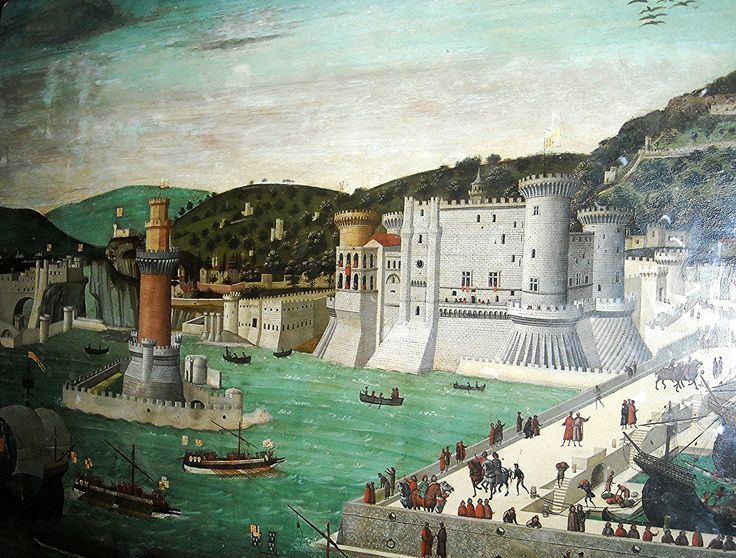 A painting of Naples' Castel dell'Ovo c1472 attributed to Fransesco Rosselli. Source for this post, BBC History Magazine December 2016 issue. This kind of architecture is how people can tell American is still a fairly young country - we have very little of it. It's so beautiful; was it built with paid labor or indentured servants and slaves? I wonder if the "prophetic" gates was how some superstitions got started.